The Washington Capitals held a one-point lead in the division when the sun came up on January 1st, but that lead was over the New Jersey Devils. The teams representing Pennsylvania were last and next to last in the division. Fast forward to Friday morning, and the Pennsylvania teams have replaced the Devils one-point behind the Caps. It has not been an accident. How it happened is in the details. We can look at them from a high perch, descending into the nitty-gritty. The standings from January 1st show clearly that the Pennsylvania teams – the Philadelphia Flyers and the Pittsburgh Penguins – have been the class of the division. In fact, as the standings indicate, it is not that the Caps have been awful. Their 10-7-4 in the 2018 portion of the season is still third-best in the division. And it is 94-point pace over a full season, so even with a “slump,” it is a playoff pace, but we will get back to this in a moment. The Pennsylvania teams have been just so much more successful in the new year, the Flyers and Penguins well clear of the rest of the division with 127- and 129-point paces, respectively. Only Flyer and Penguin fans would consider either number sustainable, and they wouldn’t think so for the other of the two clubs. But back to the Caps on this point. The 10-7-4 record includes a three-game winning streak to start the new year, the trailing portion of what was a five-game winning streak. The 7-7-4 record since then should be of some concern as the Caps head into the home stretch. 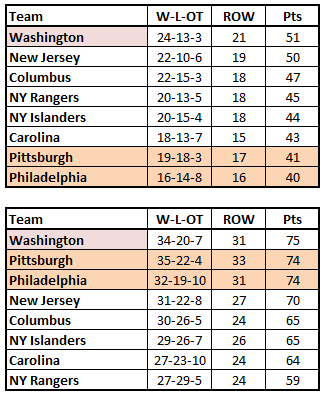 What seems clear from the scoring in the division in the new year is that with the exception of the Pennsylvania teams, the rest of the division (with the notable exception of Columbus) has forgotten how to play defense, how to tend goal, or both, five of the clubs (including the Caps) allowing three or more goals per game since January 1st. The poor defense (again, Columbus being a special case because they can’t hit the lake off their own dock shooting the puck) is the fault line in scoring, the two teams that can actually balance good scoring defense with good scoring offense being the only teams with a positive goal differential in the new year. However, is Pittsburgh really that good to average beating opponents by almost a goal and a half per game? Is Philadelphia really good enough up and down the roster to score almost three and a third goals per game over the rest of the season? But back to the Caps. Their scoring defense is the concern here. Giving up 3.33 goals per game since January 1st is actually a little better than it is upon closer inspection. Take away the three-game winning streak to start the year, and that average goes up to 3.44 per game. Looking at the Metro special teams performance in the new year, it just doesn’t seem to matter on a fundamental level in win-loss success. Sure, there are those Penguins, with the best special teams index (STI: power play plus penalty kill percentages), but given their record and the scoring differential dominance overall, it is either a luxury or overkill, depending on where you sit in terms of rooting interest in that team. Being a product of having both the best power play and the best penalty kill in the division since January 1st just makes one love/hate them even more, again, depending on your rooting interest. With respect to the Caps, their STI is over 100, the standard of performance for this measure, a good thing. But what tempers this is the fact that the Caps have the second-worst differential in power play opportunities and shorthanded situations, having five more of the latter (65) than the former (60), although in what might be the oddest fact here, the Penguins have the worst differential (minus-6). What it means is that while the Caps have a positive special teams goal differential (plus-3, the last column in the table), that is a product of the two shorthanded goals they scored in 2018 as of Friday morning. Pittsburgh is on top of this area, too, having both the best save percentage and goals against average. What makes it a bit odd is that the numbers improve as one goes down the depth chart in this span of time – Matt Murray (2.52/.922 in 11 games), Tristan Jarry (2.43/.923 in seven games), and Casey DeSmith (2.03/.939 in five games). And not only has Pittsburgh’s goaltending overall been the best, at least among the usual top-end numbers, it has been substantially so. On the other hand, given the scoring defense of the rest of the division, it might be that the division is experiencing a wide-spread goaltending slump. As for the Caps, only the New York teams – the Rangers and Islanders – have worse overall goals against averages, although the Caps are in the middle of the save percentage pack. What Braden Holtby and Philipp Grubauer have faced is as high volume of shots, the 33.71 per 60 minutes being the third-highest of the division. 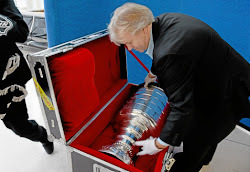 Still, expectations are higher than a .904 save percentage and a 3.24 goals against average at this point of the season. The teams in the division one has to shake their head at, though, are Philadelphia and the Islanders. In the Flyers’ case, can they keep holding teams to 27.84 shots per 60 minutes, best in the division? Given their .904 collective save percentage, higher shot volumes could burst the balloon than has lifted them to within a point of the Capitals. With the Islanders it is a case of non-support. They are allowing 40.11 shots on goal per 60 minutes in 2018, almost six more shots per 60 minutes than the Rangers (34.55). It is a team that has already allowed teams 50 or more shots on goal four times since January 1st. If there is a pattern or a relationship to be found here, they are hiding themselves rather well. The best that might be said here is that over a sufficiently large population of events, shot attempt percentages will align with success. Here, we apparently have an insufficiently large population of events for that relationship to express itself. How else are we to account for Carolina leading the division in overall 5-on-5 shot attempts-for (SAT) percentage and the Flyers a shade under 50 percent? Not to mention they are at the top of this category when ahead, tied, or close. And in the strange, there is Columbus being awful when ahead and very good (perhaps in the desperate sense) when behind. What should concern Caps fans is how the team is overperforming (in terms of wins and losses) their numbers in this category. The number that stands out is the shot attempts for at 5-on-5 – dead last in the division in total and next to last per game (ahead of only the Rangers) since the first of the new year. The Caps have had an issue with these numbers for most, if not all of this season, and it has yet to bite them. 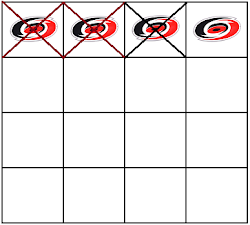 However, given the Caps 10-7-4 record (and 7-7-4 in their last 18 games), perhaps the reckoning is at hand. The Flyers and Penguins have done well to drag themselves out of the basement to challenge for the division lead. However, given the number of games played in 2018 so far and those that remain until the end of the regular season, the question for them is whether their performance is sustainable. Scoring almost four goals a game, especially when it is fueled by a better-than-30-percent power play and a shooting percentage north of 12 percent as a team (12.1, tops in the division over this period) seems rather extraordinary, not to mention difficult to sustain over a half-season, from January into April. For the Flyers, the secrets of their success are not obvious. Both their scoring offense and scoring defense have been good, but not so good to dismiss either as being impossible to sustain. Their special team index is unimpressive, and it is unbalanced – a good power play (25.4 percent power play, 71.7 percent penalty kill). Their goaltenders are, as a group, middle of the road in this division, and they are breaking in a new one (Petr Mrazek) due to injuries. Their 5-on-5 numbers do not excite. One wonders if the Flyers not having to depend on an outlying number makes their performance easier to sustain over games to come. For the Capitals, the situation is a strange one. They are actually shooting more efficiently since January 1st (11.2 percent overall) than they did in the season to that point (10.4 percent). Their power play has been good (25.0 percent). Then again, offense is not their problem. Only the New York teams – the Rangers and Islanders – have allowed more goals per game than the Caps. Only those teams have allowed their goaltenders to face more shots per 60 minutes, and only those teams have allowed more shot attempts against at 5-on-5 per game than the Caps. Defense was always going to be the big issue with this team this season, despite losing a couple of top six forwards and their offensive contributions. It remains the big issue. The Caps simply have allowed too many shot attempts, too many shots, and too many prime scoring opportunities to be able to keep their distance from the Penguins and Flyers. If the Capitals cannot correct this problem, at least in part, then Capitals Nation had better hope that what the Flyers and Penguins have done in the new year is not sustainable.